The macula is located roughly in the center of the retina, temporal to the optic nerve. 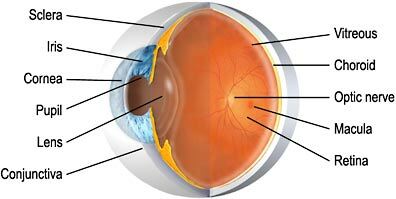 It is a small and highly sensitive part of the retina responsible for detailed central vision. The fovea is the very center of the macula. The macula allows us to appreciate detail and perform tasks that require central vision such as reading. When the central portion of the retina (the macula) accumulates fluid, it tends to swell like a sponge. This swelling occurs in tiny grape-like clusters and looks like a cyst, hence the name cystoid macular edema (CME). Patients with CME frequently notice their reading vision to be blurred. Macular edema is a serious complication of uveitis and can cause permanent loss of vision if not properly treated. Multifocal choroiditis and panuveitis (MCP) is a posterior chorioretinal inflammatory disease of unknown etiology with prominent elements of vitritis and anterior segment uveitis. MCP affects predominantly young, otherwise healthy adults in their imd-30’s, with a range of 9 to 69 years. Women outnumber men by more than 3:1. The majority of patient have bilateral asymmetric disease, with the involved fellow eye at times being totally quiescent and asymptomatic. MCP is a chronic disease that may persist for many years, with the vast majority of patients experiencing multiple inflammatory recurrences in one or both eyes. MCP is more often resistant to protracted effective treatment with systemic and regional steroids. Immunosuppression treatment has been found to preserve vision. A class of medications, “dilating drops”, used to temporarily enlarge (dilate) the pupil . Dilation of the pupil allows the eye care specialist to better view the inside of the eye. Mydriatics are also used during active inflammation to prevent the lens from sticking to the iris and the formation of posterior synechiae. Nearsightedness, or myopia, as it is medically termed, is a vision condition in which near objects are seen clearly, but distant objects do not come into proper focus. Nearsightedness occurs if your eyeball is too long or the cornea has too much curvature, so the light entering your eye is not focused correctly on the retina. In proliferative retinopathy, new, fragile blood vessels grow on the surface of the retina. These new blood vessels are called neovascularization, and can lead to serious vision problems, because the new vessels can break and bleed into the vitreous. (The vitreous is the clear, jelly-like substance that fills the center of the eye.) 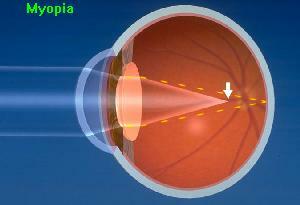 When the vitreous becomes clouded with blood, light is prevented from passing through the eye to the retina. This can blur or distort vision. In addition, abnormal blood vessels can grow on the iris, which can lead to glaucoma. The new blood vessels can also cause scar tissue to develop, which can pull the retina away from the back of the eye. 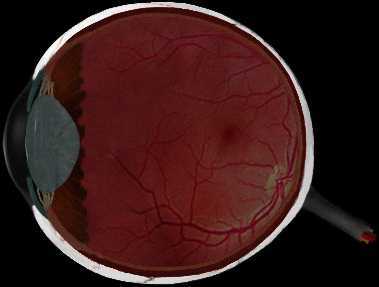 This is known as retinal detachment, and can lead to blindness if untreated. The ability to see object in dim light. See ROD CELLS. A group of drugs, such as aspirin and aspirin-like drugs, used to reduce inflammation that causes joint pain, stiffness, and swelling.NSAIDs are also effective in combating some forms of uveitis, and may allow the use of less steroid. We are often asked what distinguishes a Uveitis Specialist from an Ocular immunologist. An Ocular Immunologist is an ophthalmologist who has, by virtue of advanced training in Ocular Immunology, developed highly specialized diagnostic and therapeutic skills in caring for patients with destructive inflammatory diseases of the eye mediated by abnormal immunoregulatory processes. Ocular Immunologists have advanced training and clinical experience with all inflammatory diseases of the eye, with systemic autoimmune disease, and with systemic immunomodulatory chemotherapy. A Uveitis Specialist is an ophthalmologist with a special, specific interest in uveitis, and who has become proficient in the diagnosis and management of patients with uveitis. The most straightforward way to do this is to complete at least one year of advanced training, a dedicated Uveitis Fellowship training program, aimed at development of expertise in the diagnosis and treatment of all forms off uveitis. If you are seeking a consultation regarding immunomodulatory chemotherapy for treatment of uveitis or other ocular inflammatory disease, it is worth knowing that physicians with advanced Fellowship-level training in Ocular Immunology are more likely to be equipped, by virtue of their training and experience, to render a balanced and expert opinion on the full range of treatment options that should be considered, and to be able to provide immunosuppression chemotherapy should it be recommended. We strongly recommend that anyone with ocular inflammatory disease be treated by a physician who has completed a Fellowship in Uveitis or in Ocular Immunology. It is perfectly appropriate to ask any physician, whom you are considering having as part of your team, about their specific Fellowship training in Uveitis or Ocular Immunology. Inflammatory disease occurring inside any part of the eye, or in the tissue, nerves, muscles or structures that surround the eye. An ophthalmoscope is an instrument that allows a doctor to examine the inside of a patient’s eye. The instrument has an angled mirror, various lenses, and a light source. With it a doctor can see the vitreous humor (fluid in the eye), the retina, the head of the optic nerve , and the retinal vein and artery. See, also, indirect ophthalmoscope. The optic nerve is the bundle of over one million nerve fibers that carry visual messages from the retina to the brain. The optic nerve from each eye splits, and half of the nerve fibers from each side cross over to the other side at the optic chiasm. Because of this arrangement, the brain receives information via both optic nerves for the left visual field and the right visual field. Optic neuritis is inflammation of the optic nerve. The International Uveitis Study Group classification schema for uveitis has been widely adopted for clinical and research purposes. It separates uveitis by anatomical location of the disease, according to the major visible signs, in the various segments of the eye: anterior uveitis, intermediate uveitis, posterior uveitis, and panuveitis. When inflammation is located in multiple parts of the same eye (anterior, intermediate, and posterior sections), it is classified as panuveitis. See, also, CLASSIFICATION of uveitis. The pars plana is part of the ciliary body. The ciliary body is divisible into two parts: the pars plana and the pars plicata anteriorly. Pars planitis is inflammation of the pars plana, a part of the ciliary body. 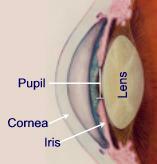 The ciliary body is the structure behind the iris responsible for making aqueous humor, the fluid in the eye that nourishes the lens and cornea.Pars planitis is one form of intermediate uveitis, and some physicians may use this term, “intermediate uveitis”, to describe the condition rather than pars planitis. The ciliary body is divisible into two parts: the pars plana and the pars plicata.Pars planitis is a form of uveitis, one of a diverse group of potentially blinding but treatable inflammatory eye disorders affecting the middle layer of the eye know as the uvea or uveal tract. 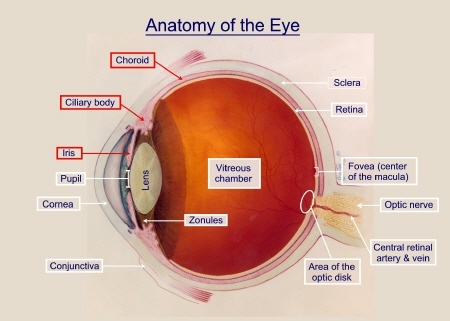 The uvea, responsible for the eye’s blood supply, is made up of three structures: the iris, the ciliary body, and the choriod. The pars plana is part of the ciliary body. Pars planitis can occur in one or both eyes. In some instances, this disorder occurs as a complication of systemic illness. In other cases, the cause cannot be determined. In either instance, pars planitis is a treatable condition and may require the use of systemic immunosuppression medication and/or surgery to halt it’s progression. Untreated, 20% of patients with pars planitis will have significant vision loss, and some will become blind. There also may be the presence of cataract, especially posterior subcapsular, and cystoid macular edema. In extreme cases, there may be retinal vasculitis and neovascularization. In some instances, this disorder occurs as a complication of systemic illness. In other cases, the cause cannot be determined.MS has been reported to develop in 7.4% of patients with pars planitis. Inflammation is a characteristic reaction of tissues to injury or disease. It is marked by four signs: swelling, redness, heat, and pain. When immune system cells and molecules invade tissues and organs as part of an immune system response, the collection of immune system cells and molecules at a target site is broadly referred to as inflammation. 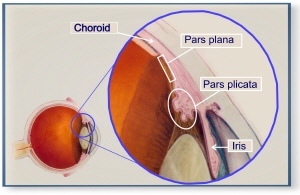 Once the pars plana develops inflammation, white blood cells and other by-products of that inflammation, (“inflammatory exudates”), are spilled into the middle chamber of the eye, called the vitreous chamber, where the patient can observe “dots” or “streaks” or “stuff” in their visual field. This is the same view, a photograph of the eye of a patient with pars planitis. Inflammatory exudates, white blood cells and other material for the inflamed pars plana, cloud the fluids in the middle of the eye, making it difficult to examine the rear of the eye clearly, and making it difficult the person looking “out” to see normally as well. The first observable sign of pars planitis is the accumulation of inflammatory exudates in the vitreous. The medical terms for this is “vitritis”. The accumulation may be small or extensive and is typically relegated to the inferior retina by gravity. That is, over time, gravity causes the inflammatory material to settle on the retina (see Figure 2). There also may be the presence of cataract, especially posterior subcapsular, and cystoid macular edema. In extreme cases, there may be retinal vasculitis and neovascularization. This disorder can affect children as well as adults. In some instances, pars planitis occurs as a complication of systemic illness. In other cases, the cause cannot be determined and the disorder is termed “idiopathic” in this instance. Among all causes of uveitis, the mean age of onset is clearly younger in patients with intermediate uveitis, 30.7 years (+ 15.1 years). The most common causes of intermediate uveitis are idiopathic (69.1%), sarcoidosis (22.2%), multiple sclerosis (MS) (8.0%), and Lyme Disease (0.6%). Multiple sclerosis (MS) has been reported to develop in 7.4% of patients with pars planitis. There are many health conditions associated with the broader category of uveitis. Pars planitis is a treatable condition and may require the use of systemic immunosuppression medication and/or surgery to halt it’s progression. Chronic steroid use no longer represents the standard of care for this disorder.Untreated, 20% of patients with pars planitis will have significant vision loss. Once vision loss from pars planitis has occurred it can not be reversed, so early treatment of the disorder, before there is vision loss, is very important. The need for aggressive treatment of pars planitis has, generally, been underappreciated by the medical community but is now well documented in the medical literature. Patients with pars planitis are urged to seek care from a uveitis specialist or ocular immunologist. Pars Planitis: A Syndrome of Unknown Etiology or Multiple Etiologies? Patients with uveitis starting before the age of 16 ye ars represent 5% to 10% of the total uveitis population. Uveitis is a serious, potentially vision-robbing problem for anyone. But it is an especially cruel disease in children and is associated with unique problems. The manner of initial presentation and treatment options differ significantly from those of adults. Children with uveitis may be asymptomatic due to the preverbal age of the child, or they may actually be asymptomatic because of the insidious nature of the disease. Consequently, the child may already have serious complications of chronic uveitis at initial presentation to the ophthalmologist. Furthermore, the adverse effects of prolonged topical steroid use and the risks of systemic treatment must be considered carefully in young patients who have developing skeletal and reproductive systems. In our study of 130 patients 16 years of age and younger, referred to the Uveitis and Immunology Service of the Massachusetts Eye and Ear Infirmary, Harvard Medical School, between 1982 and 1992, the causes of uveitis were as follows: Juvenile rheumatoid arthritis-associated uveitis was the largest group (41.5%), followed by idiopathic uveitis (21.5%) and pars planitis (15.3%). Toxoplasmosis accounted for 7.7%; toxocariasis (3.1%), sarcoidosis (2.3%), Vogt-Koyanagi-Harada syndrome (2.0%), acute retinal necrosis syndrome (2.0%), HLA-B27+ associated uveitis (1.0%), Reiter’s syndrome (2.0%), and also 1.0% each for systemic lupus erythematosus, Adamantiades-Bechet’s disease, Fuchs’ heterochromic iridocyclitis, tubulointerstitial nephritis and uveitis syndrome (TINU), and chickenpox). There are, at any one time, approximately 11,500 cases of Pediatric Uveitis in the United States, with 2,250 new cases occurring each year. 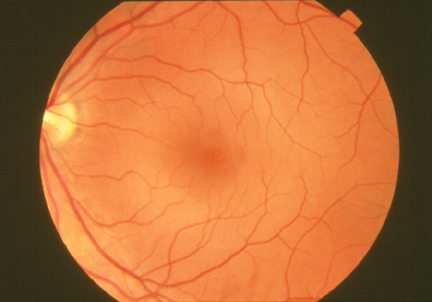 Spread across the entire U.S. population, therefore, and across all offices of Ophthalmic practitioners, the likelihood that any one individual practitioner will care for a patient with Pediatric Uveitis is relatively small, and the likelihood that any single individual will have significant experience in caring for large numbers of cases over a long period of time is vanishingly small. This accounts, we believe, at least in part for the sub-optimal care that many of our children with Uveitis appear to be receiving, even in these “modern” times. The stakes are incredibly high, for the child, for the parents who will be faced with (usually) many years of dealing with this health problem in their child, and for society at large because of the life-time of dependence which occurs in those who eventually reap substantial visual handicap as the result of sub-optimal treatment. For a discussion of these important issues, click here. The photoreceptor layer of the retina, highlighted here, is composed of light-sensitive cells called rods and cones. 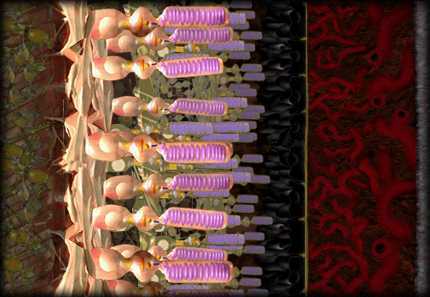 Light images are converted into electro-chemical signals inside the photoreceptors. The posterior chamber is the space between the back of the iris and the front face of the vitreous; filled with aqueous fluid. Inflammation predominately located in the posterior vitreous, retina, and/or choroid. Posterior means “rear” or “back.” Posterior Uveitis is a vision disorder characterized by inflammation of the layer of blood vessels underlying the retina, and usually of the retina as well. Major symptoms include blurred vision, distortion of the size or shape of objects (metamorphopsia), and floating black spots in the visual field. The resulting scars may impair clear vision and cause dimness of vision (amblyopia). In many cases, this disorder occurs as a complication of systemic illness. In other cases, the cause cannot be determined. The pupil is the adjustable opening at the center of the iris that allows varying amounts of light to enter the eye. The inside of the eye can be visualized through the pupil. The pupil appears dark because the inside of the eye has no light. In order to see inside the eye, a very bright light is used during the eye examination. A period during which symptoms of disease are reduced (partial remission) or disappear (complete remission). The retina is the light-sensitive layer of nerve tissue that lines the rear two-thirds of the eye. The retina converts images from the eye’s optical system into electrical impulses sent along the optic nerve to the brain. 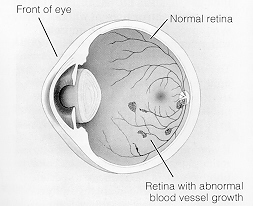 The retina contains millions of photoreceptors that capture light rays and convert them into electrical impulses. These impulses travel along the optic nerve to the brain where they are turned into images. There are two types of photoreceptors in the retina: rods and cones. 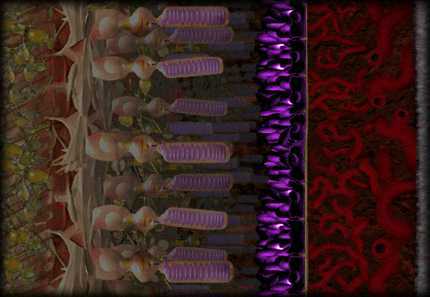 The pigment cell layer that is located just outside the retina and attached to the choroid. The RPE is show in this illustration in purple. The RPE is a dark layer under the photoreceptors. Cells of the RPE absorb excess light and transport oxygen, nutrients and cellular wastes between the photoreceptors and the choroid. Inflammation mainly located in the retina. See POSTERIOR UVEITIS. One type of specialized light-sensitive cells (photoreceptors) in the retina that provide side vision and the ability to see objects in dim light (night vision). Also see cones. There are approximately 125 million rods. They are spread throughout the peripheral retina and function best in dim lighting. The rods are responsible for peripheral and night vision. Sarcoidosis is a chronic, noncaseating granulomatous disease of unknown etiology (unknown cause) that affects many organs and tissues, especially lungs, but also involving lymph nodes, skin, liver, spleen, eyes, phalangeal bones, and parotid glands. Uveitis is a common complication of sarcoidosis, and may be the only presenting symptom of the disease for some years. The disease can appear suddenly and disappear. Or it can develop gradually and go on to produce symptoms that come and go, sometimes for a lifetime. As sarcoidosis progresses, small lumps, or granulomas, appear in the affected tissues. In the majority of cases, these granulomas clear up, either with or without treatment. In the few cases where the granulomas do not heal and disappear, the tissues tend to remain inflamed and become scarred (fibrotic). See, also, GRANULOMATOUS, INFLAMMATION, IMMUNE SYSTEM, and AUTOIMMUNE DISEASE. Schlemm’s canal is the passageway for the aqueous fluid to leave the eye.There are small openings (“drainage canals”) around the outer edge of the iris. These canals provide the final pathway for fluid to leave the inside of the eye. They are sometimes referred to as the trabecular meshwork. See, also, GLAUCOMA and IOP. The tough, white, outer layer (coat) of the eyeball made up of connective tissue fibers. With the cornea, it forms the outer wall or coat of the entire eyeball. Six tiny muscles connect to the sclera around the eye and control the eye’s movements. The optic nerve penetrates the sclera at the very back of the eye. The sclera is covered by the episclera, a thin layer of tissue containing many blood vessels that nourish the sclera. At the front of the eye, the episclera is covered by theconjunctiva. Scleritis is Inflammation located in the sclera of the eye, the touch, white, outer layer (coat) of the eyeball made up of connective tissue fibers. Scleritis may occur as a result of various stimuli, the most famous of which is rheumatoid arthritis. But many of the so called connective tissue diseases or collagen vascular diseases may have scleritis as part of their disease spectrum. Indeed, inflammation of the sclera can sometimes be a presenting manifestation of a potentially very serious systemic disease. Sometimes inflammation in the eye will precede extraocular (outside the eye) manifestations of a serious systemic disease by many months or even a few years. This is but one of the many reasons why it is so critical for patients to regularly visit with a physician trained in ophthalmology: an ophthalmologist. 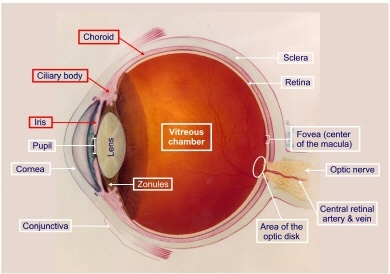 Portion(s) of the visual field (retina) that are non-functional (i.e., blind areas). Scotomas may be central, if caused by macular or optic nerve disease, or peripheral if the result of chorioretinal lesions or retinal holes. Visual field testing, if carefully done, can identify the areas affected. 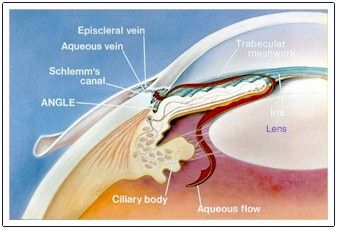 Secondary glaucoma occurs because the eye has been damaged by an infection, inflammation, tumor, an enlarged cataract, or any eye disorder that interferes with fluid drainage from the anterior chamber. Inflammatory diseases, such as uveitis, are among the most common of these disorders. Other common causes include ophthalmic vein blockage, eye injury, eye surgery, and bleeding into the eye. Some medications, such as corticosteroids, can also increase pressure in the eye. Treatment of secondary glaucoma depends on the cause. For example, when the cause is inflammation, the inflammation must be treated in addition to medication to reduce pressure inside the eye. Sometimes surgery is necessary. Glaucoma is a serious, vision-threatening complication of uveitis and requires prompt identification and aggressive treatment to prevent permanent vision loss. A condition manifested by dry eyes and dry mouth. Sjogren’s syndrome is an autoimmune disorder in which immune cells attack and destroy the glands that produce tears and saliva. Sjogren’s syndrome is also associated with rheumatic disorders such as rheumatoid arthritis. The hallmark symptoms of the disorder are dry mouth and dry eyes. In addition, Sjogren’s syndrome may cause skin, nose, and vaginal dryness, and may affect other organs of the body including the kidneys, blood vessels, lungs, liver, pancreas, and brain. The slit lamp is a microscope with a light attached that allows the doctor to examine your eye under high magnification. This instrument is primarily used to view the anterior structures of the eye such as the cornea, iris, and lens, and, with special lenses, it is possible to examine the vitreous and the back of the eye as well. The instrumentäs name is derived from its adjustable light beam. By changing the width of the beam, the doctor can gather important detail about each eye structure. Superficial punctate keratitis is a condition in which cells on the surface of the cornea are inflamed. The cause may be a viral infection, a bacterial infection, dry eyes, exposure to ultraviolet light (sunlight, sunlamps, or welding arcs), irritation from prolonged use of contact lenses, or irritation from or an allergy to eye drops. The condition can also be a side effect of certain drugs taken internally, such as vidarabine. A support group, or self-help group, is made up of people who feel they have a common problem, experience or situation and have joined together to do something about it. Support Groups are a powerful and constructive means for patients to help themselves and help each other. The Uveitis/OID Support Group is a patient education and mutual support resource founded in 1996 by Dr. C. Stephen Foster, Frances Foster MS, RN, CS, John Hurley LICSW, and patients of the Ocular Immunology & Uveitis Service. Our mission is to educate patients, their family members and friends, and the medical community about ocular inflammatory disease and to facilitate the exchange of information, emotional support, and mutual aid between members. We are also deeply committed to raising funds to support research into the causes and effective treatment of uveitis/OID. Anyone living with uveitis or other form of ocular inflammatory disease is welcome to join us.There is no membership charge, ever, for participation in our programs or resources. Support Group expenses are underwritten by voluntary, tax deductible contributions to the Uveitis Support Group Fund and by a sustaining grant from Dr. C. Stephen Foster. Sympathetic ophthalmia is a bilateral granulomatous uveitis that occurs after either surgery or penetrating trauma to one eye. The traumatized eye is called the exciting eye and the non-injured eye is called the sympathizing eye. Although not a common disease, it remains one of the most feared complications in ophthalmology today because of its potentially blinding effects in both eyes. Sympathetic ophthalmia occurs more often after non-surgical trauma. 90% of cases become manifest in the first year after injury. Although the precise mechanism of the disorder is unknown, an important factor in the development of sympathetic ophthalmia may be that penetrating trauma permits access to lymphatics and the presentation of ocular antigens to the systemic immune system in a different way from the usual, setting the stage for autoimmune inflammatory sequelae. Following a significant bout of anterior uveitis, exudates or fibrovascular tissue may result in adhesion of the iris to the lens. 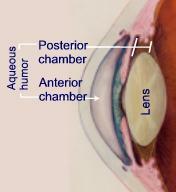 Posterior synechiae (adhesion of the iris to the lens) are more common. Focal adhesions will result in an irregularly shaped pupil and an opacity of the lens capsule at the site of adherence. If the entire pupillary margin of the iris becomes adhered to the lens, the pupil is considered to be secluded; if this prevents aqueous from flowing into the anterior chamber, the iris bulges forward (iris bombŒ), obliterating the ciliary cleft (drainage angle), and causing secondary glaucoma. 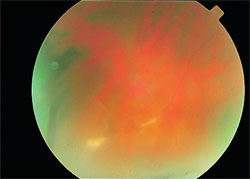 Anterior synechiae may occur at the base of the iris, in the angle, due to organization of inflammatory membranes. If these are sufficient in scope, aqueous humor outflow will be hampered and glaucoma may result. When synechiae are recently formed, the adhesion may be broken by administration of mydriatics / cycloplegics. When complete, it may produce a secondary angle closure glaucoma due to relative pupillary block.